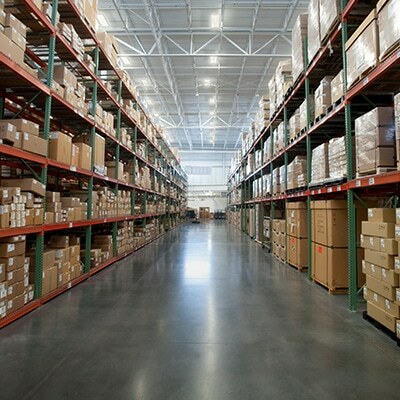 Cold storage warehouses are key waypoints in our nation’s food supply and distribution network. Due to changes in the way food is processed, moved, bought and consumed, cold storage warehouse construction is top-of-mind for players up and down the supply chain. When it’s time to consider building or expanding a cold storage space, facility managers for large-scale food processors, distributors and local grocers alike need contractors to understand some important considerations specific to these critical facilities. Obviously, the lifeblood of any cold storage warehouse is its HVAC system. These systems feature powerful ammonia cooling units that help maintain ideal temperatures. It’s crucial that these systems work efficiently. Your contractor can aid in the efficient operation of cooling systems by thinking carefully about their supporting infrastructure during design. Optimal placement of ducting, piping and other lifelines help ensure the whole system operates as efficiently—and predictably—as possible. And with a little forethought during design, any renovation or expansion of an existing cold storage facility won’t come with the added expense and headache of reorienting cooling system infrastructure. However, maintaining temperature stability and optimizing energy efficiency in cold storage warehouses requires the integration of multiple systems. Of those, a building’s insulation is probably the most important. Insulation works in tandem with the way a building is built. For instance, prefabricated steel structural components have low R-values, meaning they resist heat transfer poorly. Accordingly, steel buildings must be more heavily insulated. On the other hand, mass walls feature better thermal characteristics. A good example is Tilt-Up concrete panels. They’re better at resisting heat transfer and need not be as heavily insulated as other materials. 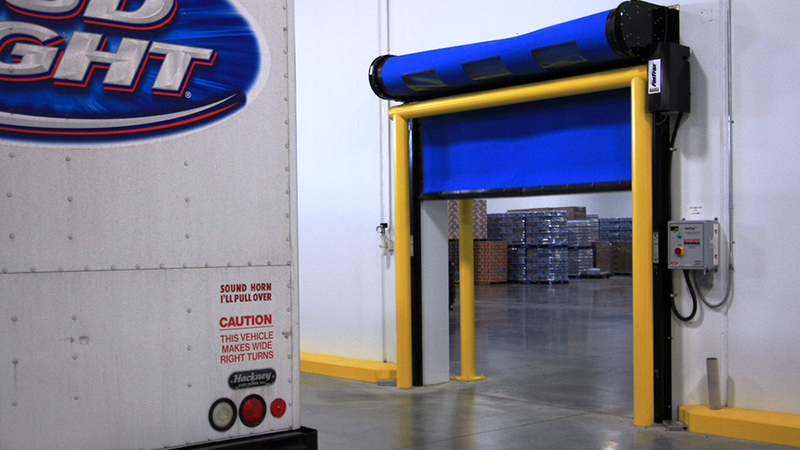 Integrating “cold docks” that feature gap control measures during loading and unloading so that warm air is kept out of the warehouse. 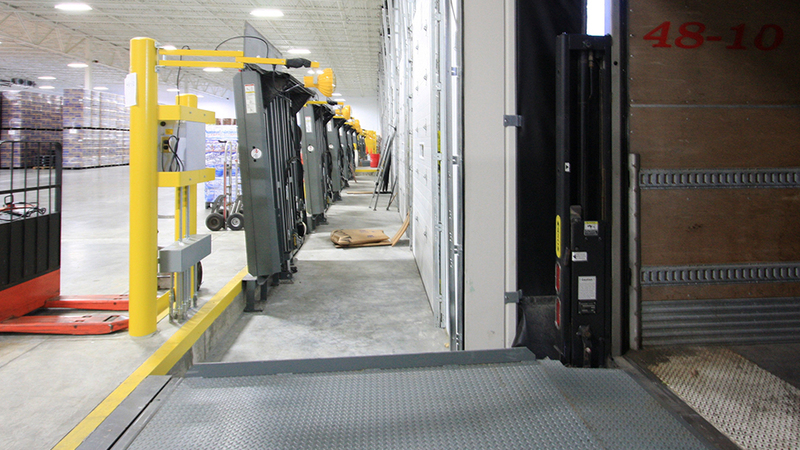 Installing cold storage doors, which are better-insulated and feature tighter seals and rapid open / close technology to minimize door icing and temperature fluctuation. An added benefit of maintaining ideal temperatures is that it promotes cleanliness by inhibiting bacteria growth. We discuss facility cleanliness in more detail below. Maintaining sanitary working and storage environments is especially important for cold storage warehouses where food is processed. These facilities are cleaned constantly. That’s why seamless construction techniques are integrated into the foundation, structure, trims, finishes and other components. These techniques eliminate recesses and crevices to prevent bacteria growth and reduce the possibility that water will collect and stagnate. Another key cold storage warehouse construction technique is the installation of floor heating systems. It seems counterintuitive to add heat in an environment where it’s usually unwanted, but heating helps floors dry after cleaning. Leftover moisture in food storage or processing settings is an invitation for bacteria to thrive, and that puts the food supply at risk. We’ve made it a point to study the rigorous food safety inspections these facilities must pass no matter the jurisdiction. And because we’ve built dozens of cold storage facilities across the country, we arrive on every new job minus the learning curve that could delay planning or lead to costly mistakes during construction. In addition to the new facilities we’ve built from the ground up, many of our warehouse construction projects have been additions and renovations to existing facilities. These projects present added challenges because they’re usually carried out while facilities remain in operation. Disrupting operations could cause processors and distributors to miss quotas and deadlines. In turn, that could affect consumers by straining the fine-tuned logistics patterns that keep prices and supplies steady. In cold storage settings, keeping work moving during construction usually requires installing temporary insulated walls that help maintain the ideal temperature in parts of the facility that must be kept operational. We’ve honed the technique on many cold storage warehouse construction projects, but we pull from our broader experience in keeping facilities running, too. Playing the long game during design also helps. If you’re building a cold storage warehouse that you know will eventually need to expand, consider installing HVAC and other infrastructural capacity to match the site’s final needs ahead of time. It’s one less thing to worry about during the renovation or expansion. Our team collaborates with facility managers in pre-construction to develop the most efficient construction plan possible. We also meet regularly with managers as construction progresses to ensure the project stays on time and that existing processes aren’t affected. Dozens of successful cold storage warehouse construction projects have shown us that well-built facilities do far more than help achieve customers’ business goals. They help maintain a safe and healthy food supply. It’s about paying attention to detail. It’s about familiarity with the special materials and cooling components that make these facilities what they are. It’s about frequent communication with managers to ensure everyone’s on the same page. Perhaps the best example of a job well done in the cold storage sector also happened to be the biggest building we’ve ever built. 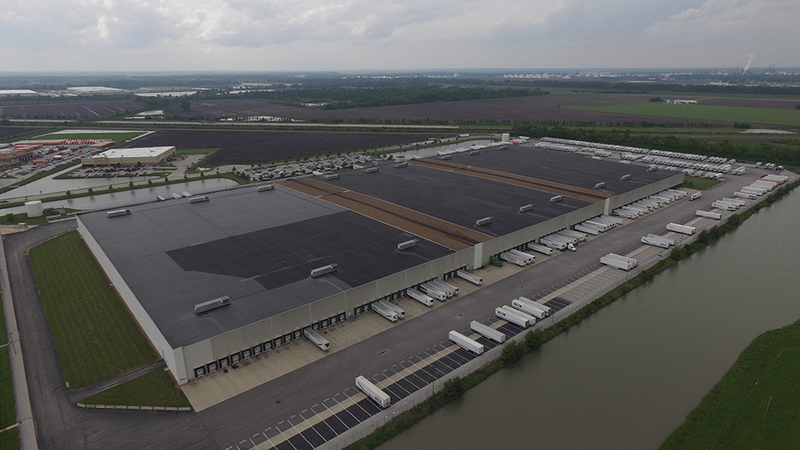 Tucked within the Gateway Commerce Center in Edwardsville, Illinois near St. Louis is the 1.1 million-square-foot Hershey Foods Midwest Distribution Center. We built it using Tilt-Up concrete panels. In addition to the distribution space, the facility features a two-story office wing. This massive space stays at a chilly 60 degrees with relative humidity held at 50% thanks to 18 rooftop HVAC units and insulated interior metal panels. It’s the perfect environment for the stockpile of chocolate worth $1,000,000,000 sitting inside on any given day. A facility this big requires robust fire protection. And while local fire departments serving the complex are certainly up to the task, they’re thankful for the help of on-site emergency water tanks totaling 500,000 gallons. The Korte Company’s Design-Build method integrates our design, engineering and construction professionals into a seamless unit. We continue to design and construct these specialized facilities across the U.S., cultivating trusting relationships and honing key skills along the way. If you’re interested in learning more about how we help add lasting value to cold storage warehouse spaces, let’s talk. You can also download the guide below to see how we use smarter design to maximize efficiency in warehouse facilities.